We all know how important it is to stock up on food, water, medical supplies, and the like. We have have enough for our immediate family and friends and many of us have enough for those family and friends who are not prepared but come to us for help and the last minute. Today I ask you if you have enough spiritual food stocked up? As the head shepherdess of our church for many years, I witnessed people go through terrible times. Times like job loss, divorce, death in the family, home fires where all worldly possessions were lost as well as natural disasters, some of which wiped out entire communities. I found that even those who were resistant to reaching out to Christ or even those comfortable, but not consistent with their relationship with HIM, that during these times of trials and disaster they all wanted support and feeding from God’s Word. They wanted prayer for themselves and their family as well. They all yearned for a higher power to help them through their personal time of trouble. That is when I realized just how important it is to always have an extra Bible, one that can be given away to someone who wants and needs the strong support of the Word of God. This is why it is so important to buy extra Bibles now, regardless of what may or may not happen in the future, just as you do with food, medical supplies and other items. Keep them on hand, be sure not to keep them all in one place either. Buy them to hand out, share during a home Bible study, there is always someone who brings a friend who didn’t bring a Bible, or with someone who is yearning for something beyond this world to help them through a terrible time. I also keep a new boxed Bible in my car all the time. When I see an opportunity, and you will be surprised how God will put those who need His support in your path, I will give them a Bible. I keep a new unopened one, still in the box, because I found when it was out of the box people thought it was my personal Bible and would not take it. I also didn’t get as many questions about the Bible in my car when it was opened and unboxed. No, I am not a Bible thumper and I do not push Bibles on anyone ever. You will know when there is an opportunity, actually, every opportunity I have had, the other person brought up something to me first related to the new Bible laying on the seat of my car. It is usually someone like the mechanic, car wash guy, or someone from work I am giving a ride to who asks a question about it. 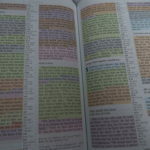 I purposefully buy the Rainbow Bibles because I like them and it is what I use, also, they are different and colorful. 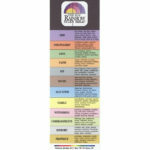 Each passage is highlighted in a color with a book mark as well as a guide at the front describing what each color represents. 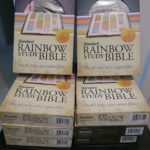 Sure, there are much smaller Bibles that I could carry around, and sometimes do, but they just don’t stand out like the Rainbow Bible does. What are your thoughts on this? 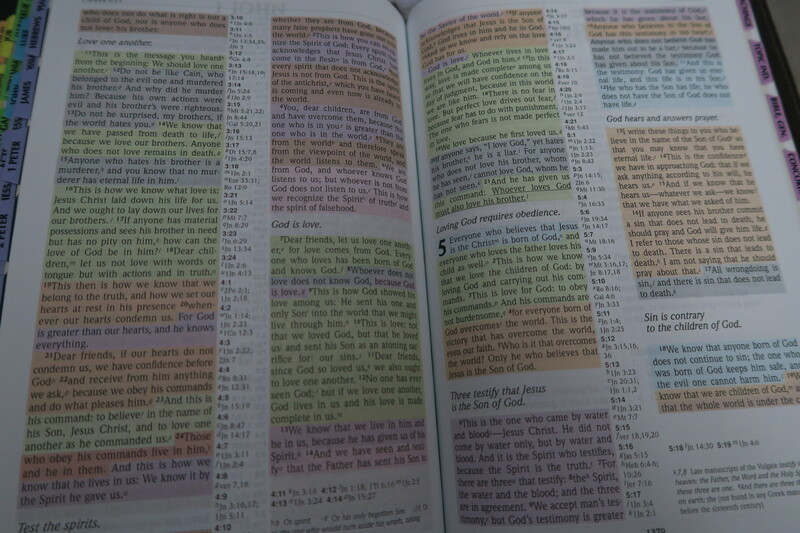 Have you ever given a Bible to a stranger or a co-worker? If so, how did that opportunity present itself to you? Please let me know in the comment section. « 13 Ways To Use A Food Saver	» Taking Care of Elderly Parents – Are You Prepared?